On some Intel® processors in certain system implementations, the frequencies seen under the Windows system properties will not match. This is understood behavior in Windows* 7 and Windows* 8. Some 3rd generation and 4th generation Intel® Core™ processors, Pentium® processors, and Celeron® processors that support configurable thermal design power (cTDP) will show this behavior. The ...first frequency shown is text included in the processor brand-string, unique for each SKU, and programmed at manufacturing by Intel. The second frequency is populated by Windows, and is generated based on a Microsoft algorithm using certain hardware and BIOS parameters. A mismatch may be present on systems with processors that support cTDP. The first frequency shown in the brand-string is associated with the Base frequency at TDP of the processor, as defined in the processors data sheet. The second frequency will align with the processors highest supported cTDP point frequency as defined in the processor engineering design specification. This is understood behavior for the configurable TDP feature and is only a cosmetic issue. This mismatch in frequency does not affect how Windows manages the processor frequencies, how the processor and Intel® Turbo Boost Technology function operates, or performance of the processor. Intel does not plan any fixes to this mismatch in frequencies. 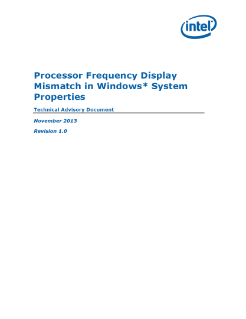 Read the full Processor Frequency Display Mismatch in Windows Properties Technical Advisory.